Southworth Sailor: What is that? I thought antennas went out with black and white TV? 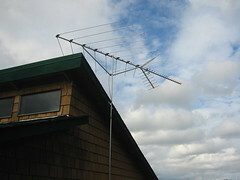 Well, in an effort to economically experience high definition TV, I hoisted one of these ugly things on my roof. (the only house with one as far as I can see) Since we are situated directly across the water from Queen Ann Hill, reception is at a premium for the distance. It works great! We get about a dozen stations, six or so which are HD. Actually, the antenna is experiencing a new surge in popularity as more and more stations have a digital broadcasts. The nice thing about digital is that there is no 'snow' or fuzziness. You either get the signal or you don't. So dust off those antennas and join the Jones'.